If you have never made 3D games before, working with rotations in three dimensions can be confusing at first. Coming from 2D, the natural way of thinking is along the lines of "Oh, it's just like rotating in 2D, except now rotations happen in X, Y and Z". At first this seems easy and for simple games, this way of thinking may even be enough. Unfortunately, it's often incorrect. Angles in three dimensions are most commonly referred to as "Euler Angles". 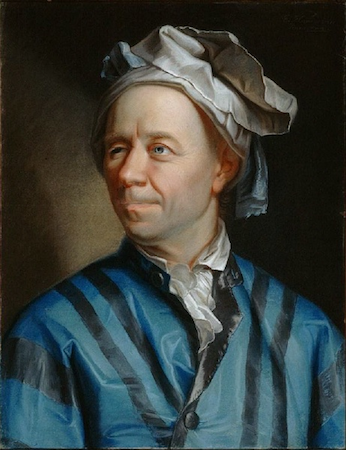 Euler angles were introduced by mathematician Leonhard Euler in the early 1700s. This way of representing 3D rotations was groundbreaking at the time, but it has several shortcomings when used in game development (which is to be expected from a guy with a funny hat). The idea of this document is to explain why, as well as outlining best practices for dealing with transforms when programming 3D games. While it may seem intuitive that each axis has a rotation, the truth is that it's just not practical. The main reason for this is that there isn't a unique way to construct an orientation from the angles. There isn't a standard mathematical function that takes all the angles together and produces an actual 3D rotation. The only way an orientation can be produced from angles is to rotate the object angle by angle, in an arbitrary order. This could be done by first rotating in X, then Y and then in Z. Alternatively, you could first rotate in Y, then in Z and finally in X. Anything works, but depending on the order, the final orientation of the object will not necessarily be the same. Indeed, this means that there are several ways to construct an orientation from 3 different angles, depending on the order of the rotations. Imagine you are working on a first-person controller (e.g. an FPS game). Moving the mouse left and right controls your view angle parallel to the ground, while moving it up and down moves the player's view up and down. In this case to achieve the desired effect, rotation must be applied first in the Y axis ("up" in this case, since Godot uses a "Y-Up" orientation), followed by rotation in the X axis. Depending on the type of game or effect desired, the order in which you want axis rotations to be applied may differ. Therefore, applying rotations in X, Y, and Z is not enough: you also need a rotation order. The camera actually rotated the opposite direction! Rotations don't map linearly to orientation, so interpolating them does not always result in the shortest path (i.e., to go from 270 to 0 degrees is not the same as going from 270 to 360, even though the angles are equivalent). 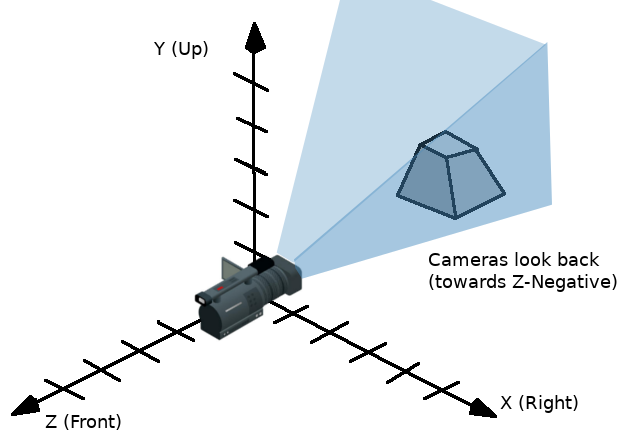 Gimbal lock is at play (first and last rotated axis align, so a degree of freedom is lost). See Wikipedia's page on Gimbal Lock for a detailed explanation of this problem. The result of all this is that you should not use the rotation property of Spatial nodes in Godot for games. It's there to be used mainly in the editor, for coherence with the 2D engine, and for simple rotations (generally just one axis, or even two in limited cases). As much as you may be tempted, don't use it. Instead, there is a better way to solve your rotation problems. Godot uses the Transform datatype for orientations. Each Spatial node contains a transform property which is relative to the parent's transform, if the parent is a Spatial-derived type. It is also possible to access the world coordinate transform via the global_transform property. A transform has a Basis (transform.basis sub-property), which consists of three Vector3 vectors. These are accessed via the transform.basis property and can be accessed directly by transform.basis.x, transform.basis.y, and transform.basis.z. Each vector points in the direction its axis has been rotated, so they effectively describe the node's total rotation. The scale (as long as it's uniform) can also be inferred from the length of the axes. A basis can also be interpreted as a 3x3 matrix and used as transform.basis[x][y]. // constructor will contain zero values for all fields. // Instead we can use the Identity property. This is also an analog of a 3x3 identity matrix. Following the OpenGL convention, X is the Right axis, Y is the Up axis and Z is the Forward axis. Together with the basis, a transform also has an origin. This is a Vector3 specifying how far away from the actual origin (0, 0, 0) this transform is. Combining the basis with the origin, a transform efficiently represents a unique translation, rotation, and scale in space. One way to visualize a transform is to look at an object's 3D gizmo while in "local space" mode. 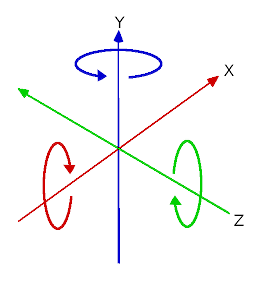 The gizmo's arrows show the X, Y, and Z axes (in red, green, and blue respectively) of the basis, while the gizmo's center is at the object's origin. For more information on the mathematics of vectors and transforms, please read the 벡터 tutorials. Of course, transforms are not as straightforward to manipulate as angles and have problems of their own. It is possible to rotate a transform, either by multiplying its basis by another (this is called accumulation), or by using the rotation methods. This rotates the node relative to the parent node. Doing successive operations on transforms will result in a loss of precision due to floating-point error. This means the scale of each axis may no longer be exactly 1.0, and they may not be exactly 90 degrees from each other. If a transform is rotated every frame, it will eventually start deforming over time. This is unavoidable. This will make all axes have 1.0 length again and be 90 degrees from each other. However, any scale applied to the transform will be lost. You might be thinking at this point: "Ok, but how do I get angles from a transform?". The answer again is: you don't. You must do your best to stop thinking in angles. Imagine you need to shoot a bullet in the direction your player is facing. Just use the forward axis (commonly Z or -Z). All common behaviors and logic can be done with just vectors. There are, of course, cases where you want to set information to a transform. Imagine a first person controller or orbiting camera. Those are definitely done using angles, because you do want the transforms to happen in a specific order. For such cases, keep the angles and rotations outside the transform and set them every frame. Don't try to retrieve and re-use them because the transform is not meant to be used this way. As you can see, in such cases it's even simpler to keep the rotation outside, then use the transform as the final orientation. Interpolating between two transforms can efficiently be done with quaternions. More information about how quaternions work can be found in other places around the Internet. For practical use, it's enough to understand that pretty much their main use is doing a closest path interpolation. 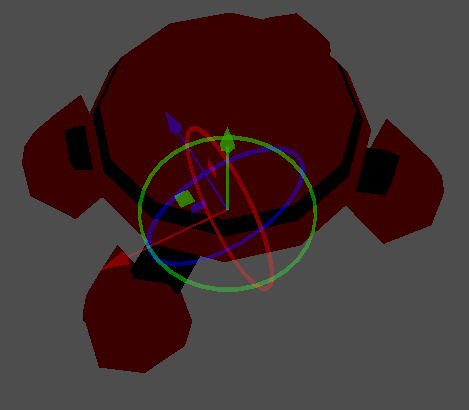 As in, if you have two rotations, a quaternion will smoothly allow interpolation between them using the closest axis. Converting a rotation to quaternion is straightforward. # Interpolate using spherical-linear interpolation (SLERP). // Interpolate using spherical-linear interpolation (SLERP). The Quat type reference has more information on the datatype (it can also do transform accumulation, transform points, etc., though this is used less often). If you interpolate or apply operations to quaternions many times, keep in mind they need to be eventually normalized or they also may suffer from numerical precision errors. Quaternions are useful when doing camera/path/etc. interpolations, as the result will always be correct and smooth. For most beginners, getting used to working with transforms can take some time. However, once you get used to them, you will appreciate their simplicity and power. Don't hesitate to ask for help on this topic in any of Godot's online communities and, once you become confident enough, please help others!